If you have authored questions, they are now available in pools, and you can (re)use them in your assessments. You may pick manually specific questions from one or more pools and add them to your assessments. Additionally, you may add draws from one or more pools. These actions are accomplished with the Add, Select, and Draw action links (see below screen shot). In the above example, AT&S will draw randomly five (5) questions from two different pools and to present all students with two specific questions. In the draws, students will get random questions from the selected pools. Once questions and / or draws have been added to an assessment, the total number of questions included in the assessment and how many points it is worth will show right above the Done and Save buttons. Also, you can specify the order that you want the draws and questions that you selected from pools or authored from scratch to be presented to your students during delivery. You can set the order by changing the number sequence in the drop down menus (see above screen shot) and clicking on Save or Done. 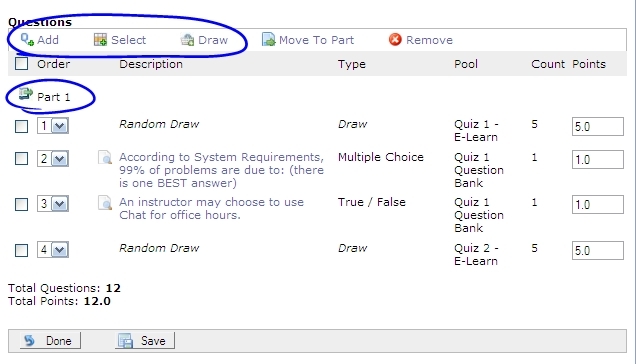 The Select option allows you to choose specific questions from your pools that you would like ALL students to get. To select questions manually, click on the Select link on the Edit Assessment page. Check the box to the left of a question you want to be on the assessment for all students. If you’re not sure if it’s the question you want for sure, click on the View Question icon (looks like a page with a magnifying glass) to preview the entire question. Click Return on that page to return to this list of questions. If you have many questions in your pools, you can narrow down by using the sort feature and sort your questions by pool, question type, point value, or even alphabetically, by question. To sort, click on the header row of the question, pool, type, or points. Another, more efficient way to find questions quickly is to use the filtering provided. Look at the drop-down menu and select the pool from where you want to select questions. Additionally, choose the type of question you want (i.e. multiple choice or essay). The software will shift through all your questions and will display just those that match your criteria. You are now ready to browse through them and make your selections. Once you’ve selected manually all the questions you want, click the Done button at the bottom of the page. You’re returned to the Edit Assessment page. The questions you’ve selected are listed.